Last weekend, the hubs and I took a day trip to nearby Princeton, Ill., to wander its two downtowns. The little community has fewer than 7,500 residents, but it is well known for its connection to antiques and arts. You can’t walk a full block downtown without coming across one antique shop or a haven for crafts and art. One shop we visited was The Makery, where hundreds of handmade goods from a dozen or more creative folks are for sale. That’s where I spotted a book lamp and adopted it. That’s also where I found the most ingenious pillows ever made. They were labeled “tote pillows.” Each one had a pocket stitched on the front, and many had book-related quotes on the pocket, such as “It’s a long story” or simply “READ” in typewriter key-styled letters. The card placed in the pocket of each pillow explained they were made to hold books or e-readers. The pillows have a handle on top, so they easily can be carried on vacation with reading material tucked in the pocket. My plan was to take one home and keep it on the bed or couch, with a go-to place for my book. The, as I’m reading, it gives me something soft to prop an elbow on or hug my arms around. I picked up four and agonized over which to buy. One had owl fabric behind the pocket, which I didn’t like. Another had red rose fabric, which doesn’t match any room in my house, but I loved the “It’s a long story” pocket. Another had a bright pattern that didn’t match much in my house, but I liked it well enough. 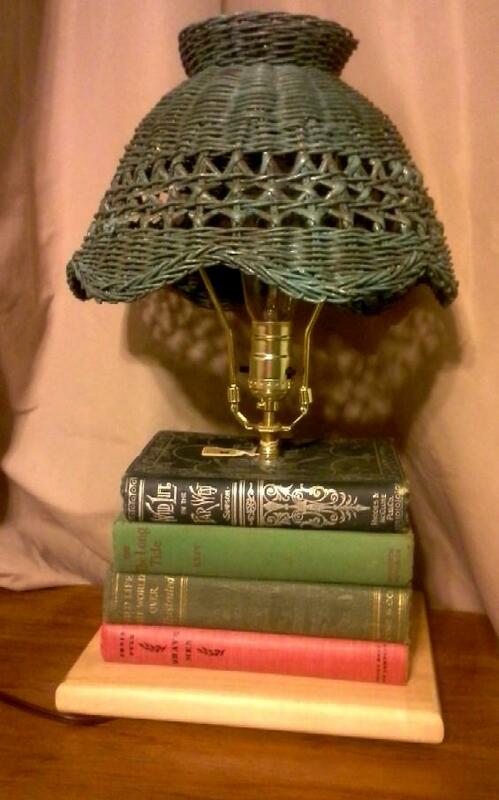 I ended up not buying any and only took home the book lamp. But I couldn’t get them off my mind, so I visited the maker (Desmond Brown Design) on Facebook. And there it was. THE PERFECT PILLOW. I commented on the photo, asking if it was available for sale. Within minutes, Desmond Brown Design owner Kelly had replied, sent me an invoice via PayPal, and promised to ship it out the next day. 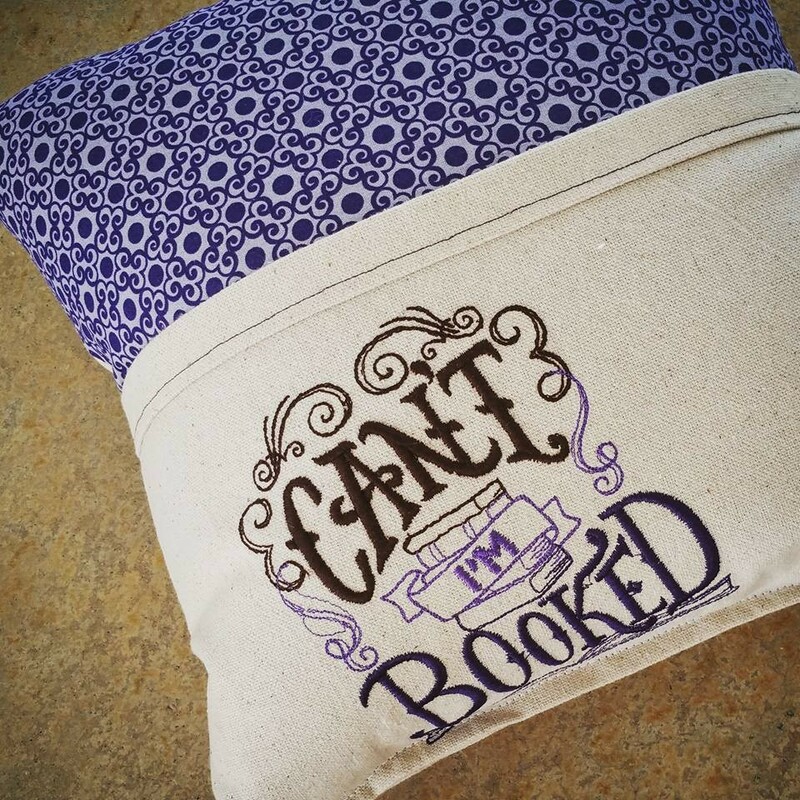 My “Can’t, I’m Booked” pillow is the perfect addition to my home’s newspaper- and book-themed decor. It’s also the perfect storage place for current reading material and a nice reading buddy (except when the cat pushes it off my lap to make room for himself). Desmond Brown Design has dozens of other pillow designs (not just pocketed pillows, either … there are regular pillows, plus several other home decor items). Check out her Facebook page. Show her some love. Order her amazing decor. This entry was posted in Reading and tagged books, home decor, reading. Bookmark the permalink.